I had never heard of Ewing’s sarcoma before she called. My old neighbor just down the street from church called me one day and said that her friend’s son, Ryan, just found out he had cancer. She wondered if I would be willing to go and visit him. The first time I met Ryan was in the hospital. I quickly learned how serious his condition was and that they were planning to do seven months of intense chemo therapy along with radiation treatments. It was going to be a long battle, but everyone was hopeful. Ryan was young and strong. He was 19 at the time and playing college baseball as a pitcher. It has been difficult to visit with someone in Ryan’s shoes because he is young, smart and a believer. It is hard for everyone who visits Ryan because they all wonder why someone like him is suffering. In those moments where cancer and death threaten a family, we all struggle with the right words to say to encourage someone to Stand Firm. Paul had to remind the Corinthians that the resurrection of Jesus, of all believers who have died and for all believers still living is real, and it is intimately connected to the whole gospel message. Yes, Paul said that God’s law gives sin the power of death. God’s law is good; it tells us to love God and one another. His law is good, but when we don’t keep it, we sin and the final punishment for that sin is death. Death shakes our faith in the resurrection because none of us can stand up to death, sin or God’s law. 30… “As surely as the Lord lives and as you live, I will not leave you.” So, he got up and followed her. When they reached the house, Elisha found that his servant had not been able to bring the boy back, so Elisha went in with the boy and he was able to bring him back. Then, Elisha called for his servant to bring the mother in and he gave her the boy, alive again. Elisha had done so much for this woman and her son but notice what she was eager to have from the prophet when she faced death. The woman was eager to have the prophet himself and his words close when she faced death. That was the gospel in just three sentences. Now I don’t mean that we only share the message once and we are done, but the words and the message of what Jesus has done is simple. Often, what makes mission work difficult is the relationship after someone is brought to faith. For example, we struggle to Stand Firm when we hear believers wants to live together before marriage. On the one hand, that’s a juicy piece of gossip and an easy thing to lay down the law to, but it is much harder to share that information only when necessary, to go and talk with the couple and to give them financial aid if it means they will live separately or be able to pay for the wedding in time to begin living together after marriage. On the one hand, to Stand Firm in the gospel means trusting in and sharing that simple message that the battle is won in Jesus. On the other hand, standing firm in the gospel means standing firm as the battle rages to hold on to Jesus. Our work in the Lord is not in vain because his work for us was not in vain. Jesus came into our world bring the Word of God to life. He came to share the gospel hope in the Savior from sin and death. He came to walk with us, to endure temptation and to face suffering. Jesus came to die and to rise from the dead. His work to save us is done. This work that Jesus called, “finished,” on the cross is what allows us to Stand Firm. Wickedness takes so many forms and often the subtle forms give us the most trouble. When we struggle to know the right words to say at the bedside of someone who is dying, the world would like us to avoid the subject of Jesus and the resurrection. This is our moment to show that our love has not grown cold, but that we have the fire of faith burning inside us that is confident of what our Lord Jesus has done. It is our time to stand or sit with those facing the fear of death and sing hymns of hope, hold their hand, pray and share the good news of Jesus. 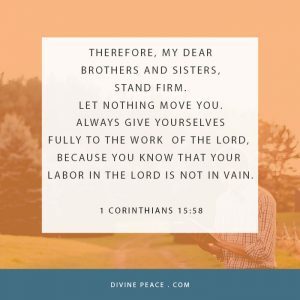 58…labor in the Lord is not in vain. We take our stand on the gospel because it is the truth. We take our stand on it because Jesus finished his work for us. We take our stand on it to keep our hold on Jesus and we take our stand on it so that we always know what to say, even when faced with death. Every time I see Ryan, it is hard because he is a young kid, smart, driven and a believer, and because he is losing his battle with cancer. Just a few weeks ago he heard that his seven months of treatment did not work, and it looks like he will be going home to heaven very soon. In those moments, we struggle to know what to say because of the fear of death. But all that fear is swallowed up by the victory of Jesus. When I meet with Ryan, I know to remind him of his Savior and the resurrection, and I know just to sit with him for a while too, so that he knows he is not alone, so that he knows the love for him by his brothers and sisters in Christ remains a burning fire, so I can calm any fears that might come up while we wait for God’s plan to unfold. I had never heard of Ewing’s sarcoma before I met Ryan, but I know Jesus and so do you. May God continue to keep you sure that the battle is won and strong to battle on as you Stand Firm in Jesus. Amen.